When your fifth graders entered our classroom door this past August, I told them that my biggest hope and goal for them was to not only be curious thinkers, but also to become or grow even more as highly engaged readers. Your child and I are happy to report that our mission has been accomplished! In addition to being highly pleasurable and a great way to pass the time, study after study has found numerous benefits to reading more. This great image from my current read, Disrupting Thinking by Kylene Beers and Bob Probst, nicely sums up some of those findings. To continue their lifelong reading journey that they started in elementary school, it is absolutely critical that your almost-sixth grader continues to choose his or her own books for pleasure reading this summer, in sixth grade, and then beyond in the future. Remember, the right book to read is the book your child chooses on their own; it’s the book they can’t wait to read, the one they may read under the covers with a flashlight, or even heard about from one of their friends, or that they included on their summer reading plan (ask your child about their well developed plan for reading this summer!). The right time to read might just be those in between times (as my literacy-ed hero Donalyn Miller so smartly points out). In between times are when we’re waiting in line, sitting at a sibling’s sports practice, or even waiting for the rest of the family to wake up on a weekend morning. The best time to read certainly does not have to be a dedicated hour. Although, wouldn’t it be great if all of us could find that hour everyday- imagine how much kinder and wiser our society as a whole would be! It is my sincere hope that your almost middle schooler continues to read for pleasure after we say goodbye on June 1st. The academic and social demands of middle school can easily allow pleasure reading to fall by the wayside. 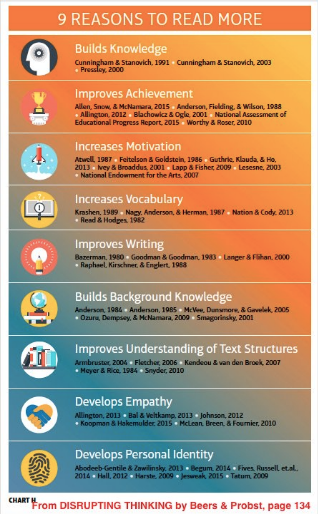 This is why every entering sixth grader needs a reading champion to keep them going with what they started way back in kindergarten and intentionally crafted here in fifth grade. Encouraging and ensuring frequent trips to the local or school library, one of our many local bookstores, or even a few downloads on a tablet are a good start! Access to books, time to read, and choice in what they read are the key to keeping our kiddos on the path to lifelong reading. It has been my absolute pleasure being your child’s reading champion this year. It is an even greater pleasure to pass this baton on to you and our greater Palo Alto & Stanford community as a whole. Remember, literacy is power- all kids are capable of great things through this power! College Terrace Library, 2300 Wellesly St.
Mitchell Park Library, 3700 Middlefield Rd. East Palo Alto Library, 2415 University Ave.
← Planning for Summer Reading: Read Aloud!